We all love horse stance and it's starting to get a bit competitive. 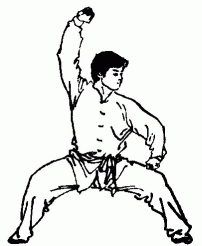 It is performed with a Gwun (Bo Staff) rested on the thighs and when the Gwun is dropped, the clock is stopped! Times recorded below are witnessed by at least two "unbribable" instructors! Once your quads are on fire from all that hoarse stance; it’s time to work those abs! This exercise involves laying on your back and holding your feet 6 inches off the ground whist keeping your legs straight and teeth gritted – once your feet touch the ground you’re done!. On to your arms and shoulders… Anyone can throw out dozens of poorly executed press ups, but how many slow ‘face to floor to full extension’ press ups can you do with a sadistic Sifu taking his time with the count? Another true test of your mental strength as well as physical – can you make the Hall?